127 mm/38 Mk30 mod. 03 х 1 pcs. 127 mm/38 Mk30 mod. 11 х 1 pcs. 127 mm/38 Mk302 х 1 pcs. 12.7 mm Browning M2 mod. 26 х 1 pcs. 127 mm/38 Mk30 mod. 04 х 1 pcs. Tier VIII's Benson is where the American destroyer line finally comes together with the complete package that makes them the most flexible destroyers in the game. The key to this transformation is access to Upgrade Slot 5 and Concealment System Modification 1 ( ), allowing Benson and subsequent American destroyers to have concealment values that rival that of those found in the Japanese destroyer line. When their newfound stealth is combined with a potent torpedo armament and fast-firing main battery guns, Benson, Fletcher, and Gearing become true jack-of-all-trades ships with an incredibly high ceiling in the hands of a skilled captain. For Benson, it all starts with her main battery. When built for maximum stealth, her detection radius of 5.8 km combined with 18 rounds per minute from each of the five guns in her main battery make her a terror to enemy destroyers. She can work in close, then cut opposing destroyers down very quickly with her high rate of fire. Beyond her main battery, Benson is the first American destroyer whose stock torpedo armament range exceeds her detection radius. She has a very long reload time for her torpedo tubes, but the torpedoes themselves are harder to detect than their Japanese counterparts and give her targets less reaction time to dodge out of the way. Even a ship as good as Benson has drawbacks. Her anti-aircraft suite might generously be called mediocre, though captains who wish to sacrifice one of her main battery guns can equip Hull (C) and have access to Defensive AA Fire ( ) to help drive off enemy planes. As a destroyer she has no real armor to speak of, and most shells that hit her will disable at least one module of some kind. Her shell arcs become challenging to use past the 7-8 km range, and require excessive lead in order to land hits. Despite the negatives, though, Benson is one of the best-balanced destroyers in World of Warships, capable of providing a valuable contribution to any team she finds herself on in the hands of a skilled captain. Excellent main battery; stellar rate of fire and fast turret traverse speed (even faster than Mahan). Two centerline-mounted quintuple-tube torpedo launchers give her a solid torpedo armament. Capable of delivering torpedoes from beyond her detection range. First American destroyer capable of lowering her detection range below 6.0 km by combining Concealment Expert and Concealment System Modification 1 ( ). Can equip the Defensive AA Fire ( ) consumable when Hull (C) is mounted. Good speed, responsive rudder, and excellent handling; Benson has the tightest turning circle of all Tier VIII destroyers. Weak armor; stealth and maneuverability are her best defenses. Anti-aircraft suite is mainly for show and will rarely shoot anything down (even with Defensive AA Fire ( ) active) unless captains invest heavily in the right mix of commander skills, upgrades, and consumables. Hull (C) reduces number of main battery guns to four when equipped. Hull: Upgrade to Hull (B) to add extra health, fractionally more AA, and improved rudder shift time. Research of Hull (B) unlocks progression to Fletcher. Unlocking Hull (C) removes one main battery gun (and comes with a corresponding reduction in long-range anti-aircraft firepower), but allows Benson to equip Defensive AA Fire ( ). Torpedoes: The Mk15 mod. 3 torpedoes hit harder, but reload 13 seconds slower; Hull (B) must be equipped before they can be installed. Gun Fire Control System: Upgrade to Mk8 mod. 2 for an extra 10% range on the main battery. Like Mahan, Hull (B) is the best place to invest early experience gains. After that, captains are encouraged to research the upgraded torpedo module for better reload times and more damage. Benson is one of the first American destroyers that can be played as a torpedo-centric destroyer if desired. Pick up the Fire Control System upgrade to her main battery range last. Hull (C) is an optional upgrade for captains who wish to maximize their defenses against enemy aircraft by gaining access to the Defensive AA Fire ( ) consumable. It is probably best skipped entirely or acquired after unlocking Fletcher. Slot 3 is most commonly filled with Aiming Systems Modification 1, but captains who have equipped Hull (C) may wish to use AA Guns Modification 1 ( ) in order to increase the intensity of medium- and long-range AA Fire. Similarly, captains looking to maximize their anti-aircraft capabilities may wish to install the special Defensive AA Fire Modification 1 ( ) upgrade into Slot 2. Benson isn't quite as flexible as her Tier IX cousin Fletcher, but she's close. Preventative Maintenance at Level 1, Last Stand at Level 2, Survivability Expert at Level 3, and Concealment Expert at Level 4 are all must-have skills for Benson commanders. Once those four basic skills have been covered, captains can begin to customize their Benson commander further. Captains wishing to focus on maximizing their main battery should sink points into Demolition Expert and Basic Firing Training at Level 3; more torpedo-minded captains should invest in Torpedo Armament Expertise instead. Level 2's Adrenaline Rush is a good buy regardless of which armament is chosen for a focus. Captains wishing to invest in a full-on anti-aircraft build should invest in Basic Firing Training and Manual Fire Control for AA Armament; Benson is capable of shooting down surprising numbers of enemy aircraft when configured properly, but it requires a heavy investment in commander skill points and upgrades. A gunboat destroyer such as Benson is inevitably going to come under heavy fire; the abbreviated cooldown on Damage Control Party II ( ) will eventually pay for itself. Shelling out the doubloons or credits here is highly recommended. Paying for Smoke Generator II ( ) is captain's choice, but there are times that the shortened cooldown on smoke is the difference between sneaking away and going to the bottom. 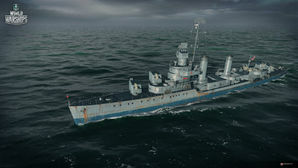 Players who wish to spend doubloons can equip Benson with Type 18 camouflage that lowers her detection radius, reduces the accuracy of incoming shells, reduces her repair costs, and increases the amount of experience she earns. "Benson" also has an alternate premium camouflage called "Ghoul", in which she appears as she does during the Halloween scenario "Sunray in the Darkness". USS Benson (DD-421) was the lead ship of her class of destroyers in the United States Navy during World War II. She was named for Admiral William S. Benson (1855–1932). Following World War II, she spent several years in mothballs before being transferred to the Republic of China on 26 February 1954. The ROC Navy re-christened her Loyang. Permanent camouflage resembles the Measure 32/22D scheme. This camouflage was actually never implemented on Benson or any ship of the class. Benson’s camouflage is actually Measure 32/3D. Measure 22 scheme which Benson wore during her early career is also missing. USS Benson (DD-421), circa 1939. USS Benson in pre-war paint scheme, 27 June 1941. USS Benson underway, circa 1944. USS Benson in Charleston, South Carolina, December 1945. USS Benson laid up in a reserve yard prior to her transfer to the Republic of China, 1948. This page was last modified on 19 February 2019, at 03:57. This page has been accessed 65,922 times.